Our vibrantly coloured 'Spring Wedding Cake' seems to have finally heralded the arrival of Spring in Scotland. 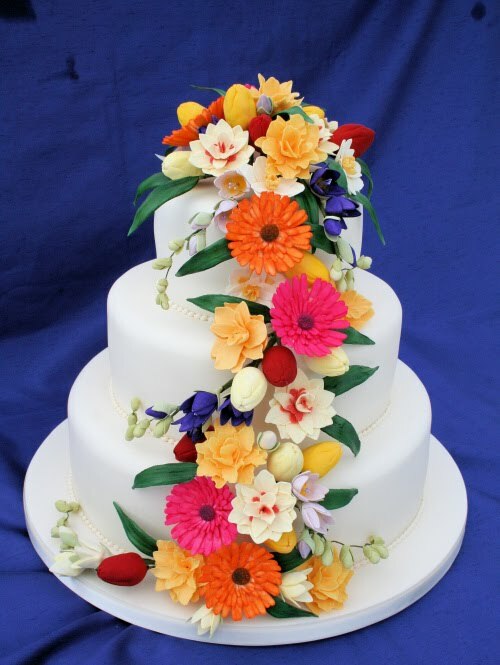 Decorated with a cascade of beautifully shaded sugar daffodils, tulips, gerbera and freesias it was a real eye-catching design. After the deluge of snow we suffered last week we're hoping brighter days now lie ahead for a long summer of sunshine blessed Wedding parties and more gloriously decorated Summer Wedding cake designs. Rainbow Sugarcraft are renowned for stunning Wedding Cakes, Croquembouche Profiterole Towers and fantastic Chocolate Wedding Cake designs. we also supply a full range of cake decorating equipment and cake decorating supplies. Popular Wedding Cakes include decadent Wedding Cake Desserts, towering French Croquembouche and incredibly detailed and lifelike sugarcraft flowers. Recent projects have includes a three foot long Welsh Dragon Wedding Cake and an eleven tier high Empire State Building. Rainbow Sugarcraft are based in the countryside not far from Edinburgh and personally deliver Wedding Cakes throughout the UK so you can be sure your cake will arrive in perfect condition and look just as you would wish. They also supply a wide range of personalised Wedding Favours, unique place name Wedding Cookies and beautifully engraved cake swords. If you're thinking of making your own cakes Rainbow Sugarcraft can provide all your cake decorating supplies and Cake decorating equipment by mail order.